Good and sweet for ribs and tender pieces of pork. Designed for the perfectly gooey texture that screams BBQ. Lightly salted. Ribs... Ribs... RIBS! There’s a time where you just have to have pork ribs. Baby backs, St Louis cut, regular spare ribs, country pork, maybe even lamb or beef ribs. Maybe you just want to have chicken thighs and legs and pretend they are ribs. If you want a classic flavor that is sticky, sweet, and will explode on your tongue this is the rub for you. 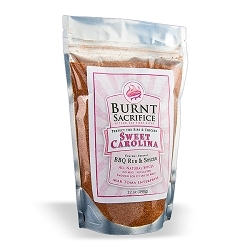 From the cradle of American BBQ comes the Burnt Sacrifice Sweet Carolina Rub. You may actually crave the authentic ancestral flavor of the bitterness and heat of the mustard powder against the lemony cumin and the rebellious chili powder and this product will answer your patriotic duty to BBQ. You may not know that Native Americans in the Carolinas slow smoked their meats using indirect heat. When German settlers arrived they loved the tender smokiness of the meat, but they needed their honey mustards and seasonings from Germany. 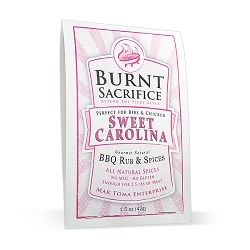 One thing led to another and the perfect balancing of these two styles became our Sweet Carolina rub. 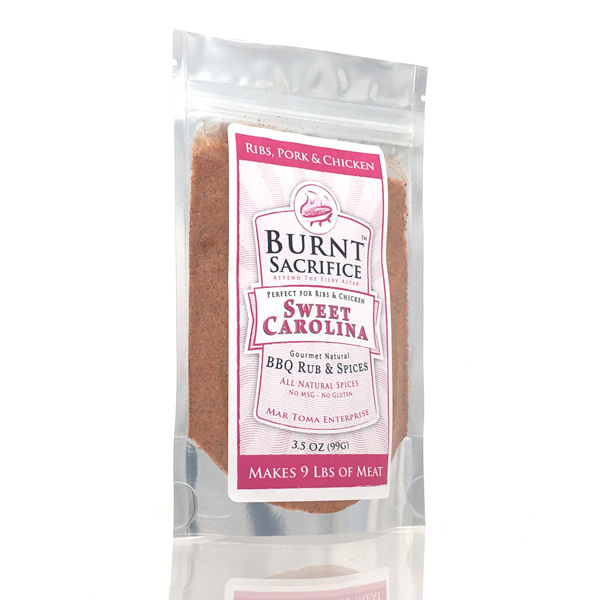 Our Sweet Carolina rub is focused on mustard and chili powder that will light up ribs, dark meat chicken and well marbled cuts of meats. The sugar and salt, when properly balanced like this, highlight the flavor on these cuts of meat. Try this if you are up for a real treat and a bite of American culinary history. You might not even need a sauce… But you are gonna want sauce for this. Ingredients: Salt, Brown Sugar, Mustard, Garlic, Paprika, Cumin, Chili Powder, Onion, Spices.